The distributed coordination and control of a team of autonomous mobile robots is a problem widely studied in a variety of fields, such as engineering, artificial intelligence, artificial life, robotics. Generally, in these areas, the problem is studied mostly from an empirical point of view. Recently, a significant research effort has been and continues to be spent on understanding the fundamental algorithmic limitations on what a set of autonomous mobile robots can achieve. In particular, the focus is to identify the minimal robot capabilities (sensorial, motorial, computational) that allow a problem to be solvable and a task to be performed. In this paper we describe the current investigations on the interplay between robots capabilities, computability, and algorithmic solutions of coordination problems by autonomous mobile robots. 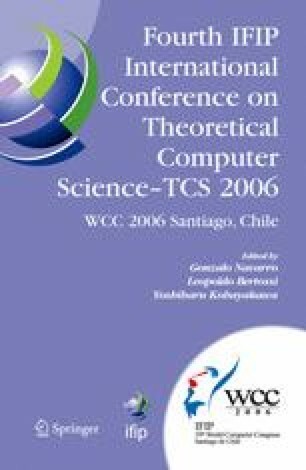 Please use the following format when citing this chapter: Prencipe, G., Santoro, N., 2006, in International Federation for Information Processing, Volume 209, Fourth IFIP International Conference on Theoretical Computer Science-TCS 2006, eds. Navarro, G., Bertossi, L., Kohayakwa, Y., (Boston: Springer), pp. 47–62.